Sada roti is a type of Indian-influenced flatbread that is found throughout the Caribbean and most often associated with Trinidad and Tobago. Of all the West Indian rotis, it is the easiest to make because it requires just three easy steps and a few common kitchen ingredients. 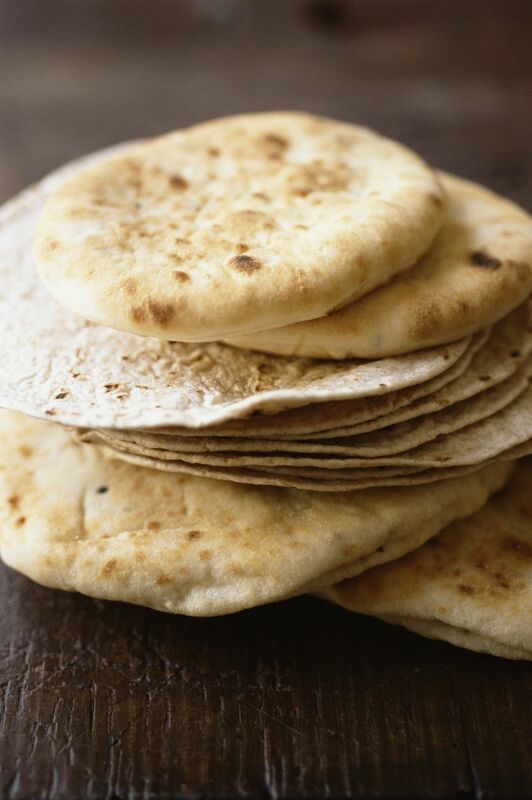 Making this rustic flatbread is very simple and it can be made in less than an hour. Half of that time is spent allowing the dough to rest. The bread is a tasty addition to almost any meal, especially baigan (eggplant) or tomato choka, two popular roasted vegetable dishes. You can also enjoy sada roti with a simple spread such as butter or jam. In a large bowl, thoroughly mix the flour, baking powder, salt, and sugar. Add the oil or ghee and rub it into the flour. Add just enough water to knead and make a dough. Once the dough comes together, knead it for 2 to 3 minutes until it becomes a soft, pliable dough. Rub the dough with a little oil so it does not form a skin. Cover and let rest for 30 minutes. Heat a cast iron griddle or pan or a tawah (an Indian-style of cast iron pan) over medium heat. Cut the dough into 4 equal pieces. Cover the rest of the dough as you work with one piece at a time. Lightly flour your work surface and rolling pin. Form one piece of the dough into a ball, then flatten it into a disk. Roll into a 5-inch circle of about 1/4 inch thickness. Transfer the rolled dough to the heated griddle or pan, lower the heat to medium-low. Let cook on one side until the roti puffs up. Flip the roti and cook the other side for 1 or two minutes. Remove roti from the pan and wrap loosely in a kitchen towel (or any flour-bag type of fabric). Repeat from step 8 until all the roti is made. Serve as is with butter, jam, a spread of your choice, or sauteed vegetables or a curry.